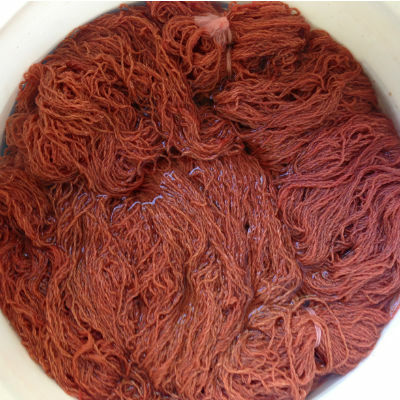 I pulled these 2 skeins out from the dye bath a week ago. I was not able to get it to rinse clean so I left it out to cure for the week. Today, I put it back in rinse water and color is still coming out. I’ve never had madder to this before. I’m not sure what to do next. I can’t use it as long as the color continues to come out of it. The above photo isn’t representative of the final color. The color is rather weak when the yarn is dry.